This page is only to introduce me and our services to the visitors. Some of the other pages of my home site also contain important instructions in English. Please search the English flag on the pages having a little flag sign on their menu buttons. Welcome to Website of J�nos Zatik, M.D., Ph.D.
Mr. János Zatik, M.D., Ph.D. was born in 1961. He educated (1976-1980) at the Benedictine grammar school of the Archabbey of Pannonhalma (it is the centre of the Hungarian Benedictine Congregation and it is the part of the UNESCO World Heritage). The school is one of the eight Catholic secondary schools which could survive even during the years of Communism in Hungary. He qualified in medicine in 1986 (M.D.) at the Debrecen University (1980-1986). Mr. Zatik worked at the Department of Pathology of the University Debrecen from 1986-1989 as a pathologist resident. He started specialising in gynaecology in 1989. From 1989 he has been working at the Department of Obstetrics and Gynaecology of Debrecen University (1989-1993 as a gynaecologist resident, 1993-2001 as a graduate assistant gynaecologist and from 2001 as an assistant professor). 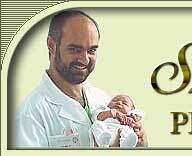 He is a qulified obstetrican and gynaecologist since 1992. He specialised in ultrasound in obsterics and gynaecology too. He recived the Ph.D. degree in medicine (Ultarasound) in 2001. He educated and graduateed as an economist from the University of Szeged with a degree in Medical economics and management (1998-2001). He is married to Judit Vas and they have four children (Zita 1990, Anna 1992, J�nos 1994, Vilmos 1997). The Szent Anna Women's OB/GYN and Ultrasound Outpatient Clinic located on 48th Szent Anna utca, in the central district of Debrecen. It is an archaistic, old-style building but well and modern equipped. The building was renovated not a long time ago. You can park at the clinic and you can see here (with maps) how to get the place. We offer a complete obstetrical and gynaecological services for women at any ages. Evaluation for and scheduling of major and minor gynaecologic surgeries. Major operations are made by dr J�nos Zatik M.D. Ph.D at the Department of Obstetrics and Gynaecology of Debrecen University. For more information or an appointment, please call (+36) 20-928-7023 or send an e-mail.